Full of innovative and interesting flaps, tabs and pullouts to entertain the young reader, this wonderful book combines the Creation story and a counting book all in one! A beautiful gift for any young child. From Abingdon. 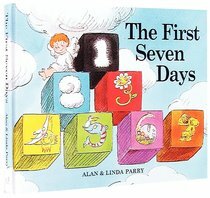 Follow the little angel and discover the wonders God created in the first seven days of the world. There are dials, tabs and flaps for young children to try out, and also help them learn to count.